We bought a cute little French bulldog named Penelope out in New Hampshire, and, on the day we went to pick her up, we decided to make a quick stop for brunch in Vermont. 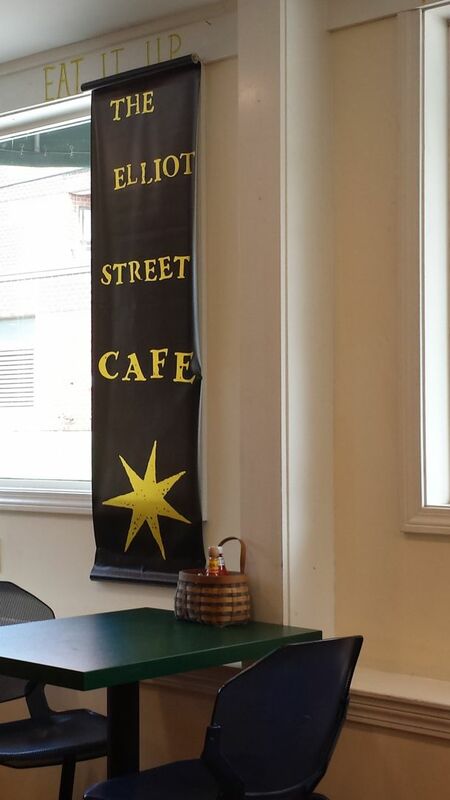 Cassie did some research and found a place called Elliot Street Cafe in the little town of Brattleboro. For a block or two, it actually reminded me a lot of downtown Albany. Elliot Street Cafe is your classic cafe and they serve breakfast all day, which is always a fun draw. 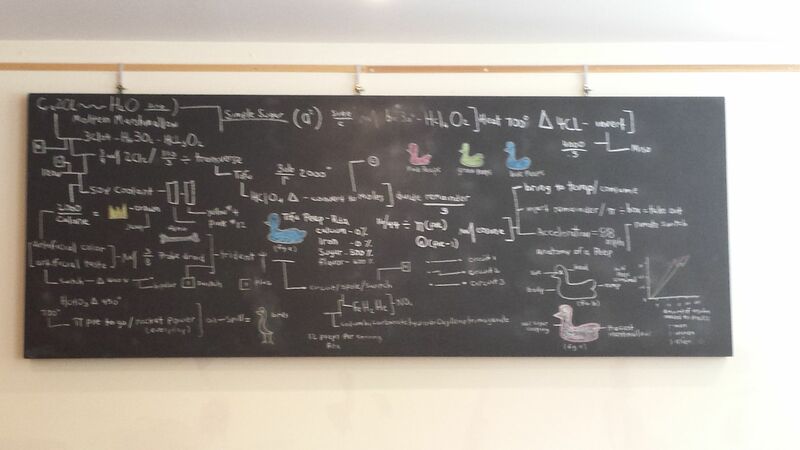 The menu has a number of interesting concoctions as well tried and true standards, so it looked like a formidable stop. 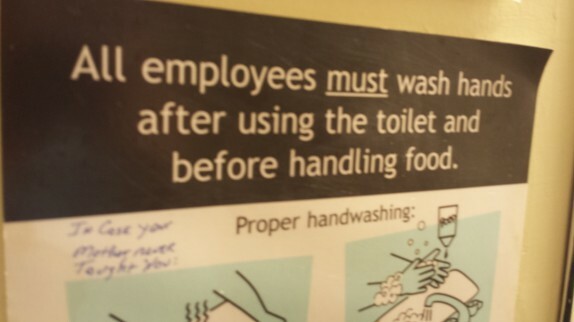 It’s set up with counter service, and you do everything from get your own silverware to get your own glasses of water. In that sense, it’s very inviting in that it’s like being in your own home. On the flip side of that, if you’re the type of person who expects stuff like this to be part of service, this may annoy you. People are different, man. 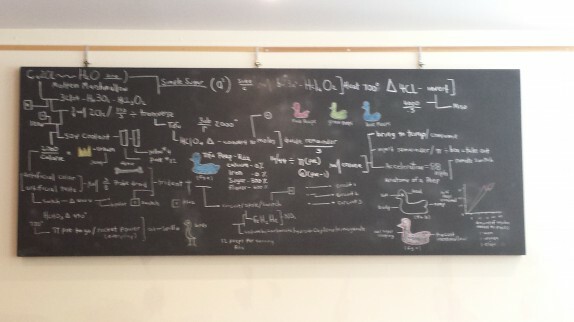 The nerd in me thought their blackboard, which had a number of scientific theories and mathematical derivations amalgamated to (I think) describe the chemistry of the Peep, was really funny. It definitely captivated me for a while. I opted to try two things. 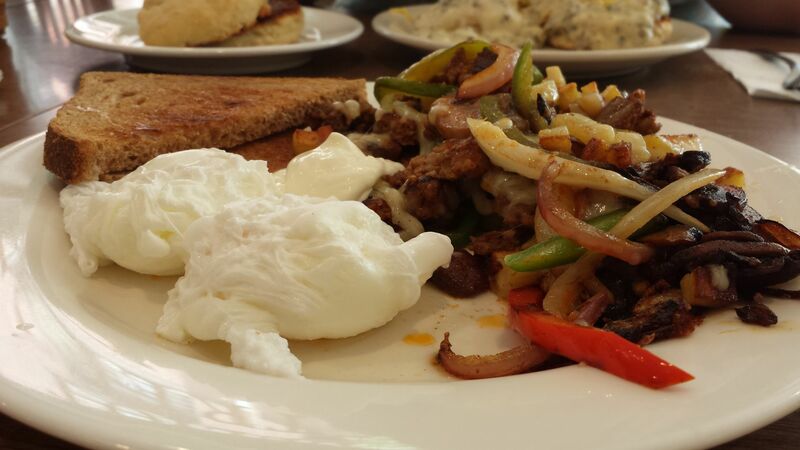 They had a chorizo hash ($8.75 – hashed potatoes & housemade chorizo sausage with peppers, onions, & mushrooms. Topped with two eggs and finished with cheddar and sour cream. Served with toast.). 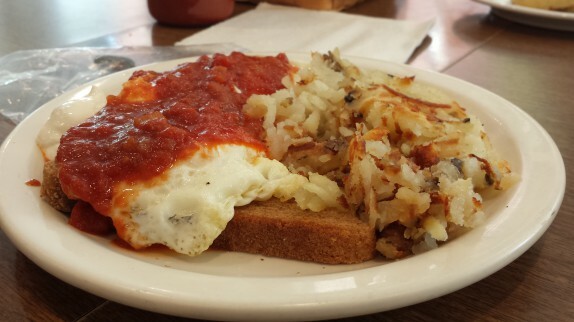 I also went for the eggs in hell ($6 – two eggs covered in a spicy tomato sauce over toast, served with hashbrowns and sour cream.). I ordered my eggs poached in the chorizo hash. The yolks in the poached eggs were as hard as can be. I didn’t really care because I really didn’t want to consume four egg yolks by the end of breakfast; it allowed me to pick the yolks out pretty easily. The hash was pretty good but, aside from the near perfect and scant chorizo, everything was underseasoned. Their homemade toast was really nice. There were bottles of sriracha all over the restaurant, so I picked one up and went to town to help add some flavor to the dish. I had a much better experience with the eggs in hell. The people in the kitchen seemed to have a much better time making eggs over easy, which is how I opted for the eggs in this dish. The tomato sauce smothering the eggs was quite good. 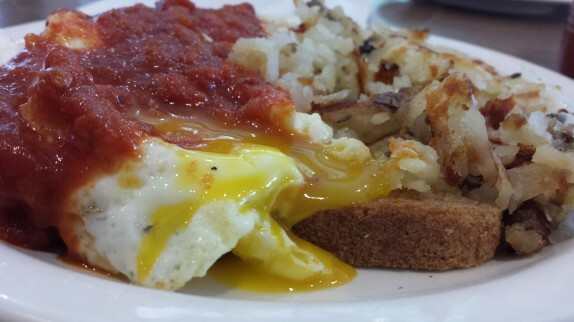 The toast was soggy since everything was served atop, but it provided a great medium to soak up all of the tomato-y and egg-y goodness. The seasoning was very balanced in this dish with the exception of the completely unseasoned hashbrowns. To add some spice, I used the sriracha, but it was totally unnecessary. Cassie had a little less luck with her biscuits with gravy. The biscuits appeared to have a strange texture, and her overcooked scrambled eggs were served atop the biscuits under the gravy. On the way out, we made a pit stop before we hit the road. We had to wait, and there was a couple of college kids fumbling through a ping pong ball game. (Fact: I’m not any better or even as good.) The bathroom was interesting, lets say; I thought their hand washing sign, which had “In case your mother never taught you” scribbled on it, was hilarious. The place certainly has a certain character and charm. The couple of misfires in our dishes were a little glaring, but it was a fun stop.